Any Ideas? – What Will Our Activities Be? This sort of ties in with the audience question, above. What activities are you planning for the guests at your event? This can be a big space consideration, especially at a wedding, where dancing is typically expected. Do you have enough space for your activities? Do you have a clearly defined space for them, or will you have to clear away one part of the party to make room for another? 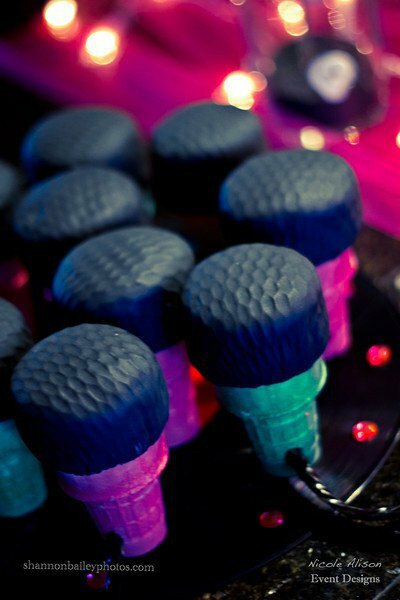 Whether you’re throwing a wedding, birthday party, or shower, how will you entertain your guests? Board games? Charades? Shower games? Scrapbooking? Photo booths? 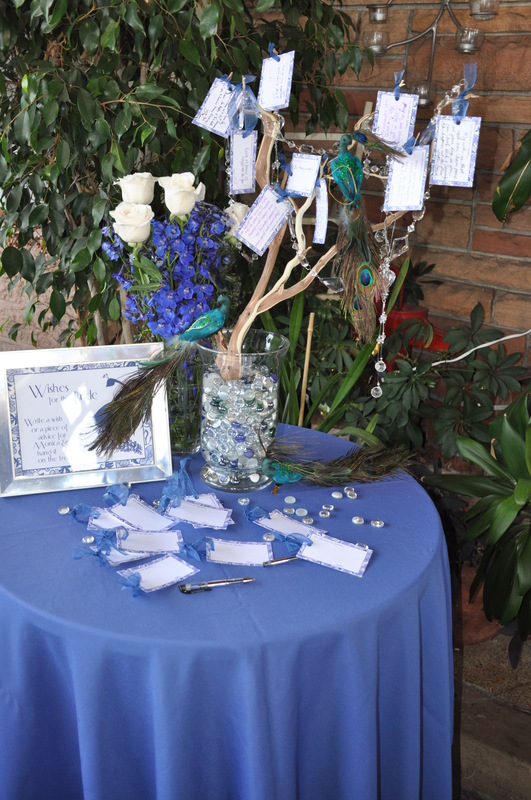 Will you make a wishing tree, or use a traditional guestbook, or paint onesies? Will you start a massive game of capture the flag, or decorate cookies, or play beer pong? When you start thinking about party themes, your party activities may or may not heavily feature in the planning process. But unless you know how your guests will spend their time, the details of your theme will be murky. Say I’m asked to plan out a party. The honoree likes my “Born on the Fourth of July” inspiration board, so I’m working with a red, white, and blue palette and going for an old-fashioned feel. 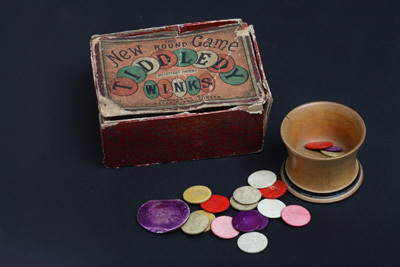 If the activities for the day included a sack race and a game of Blind Man’s Bluff, the party would have a very different overall feeling than if guests spent their time creating ice cream sundaes, or if they pulled taffy by hand or played a Tiddly Winks tournament. These would all be pretty standard Victorian-era party activities, consistent with the theme of the party, but would yield dramatically different results with your overall party theme. 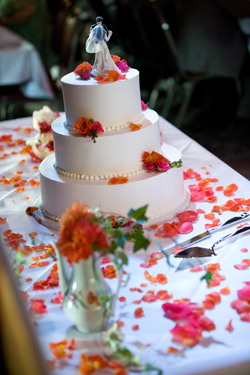 Even at a wedding, a careful planner will consider what the guests will be doing. Will there be a large enough dance floor for everyone? Is there a photo booth? A fun guest book? 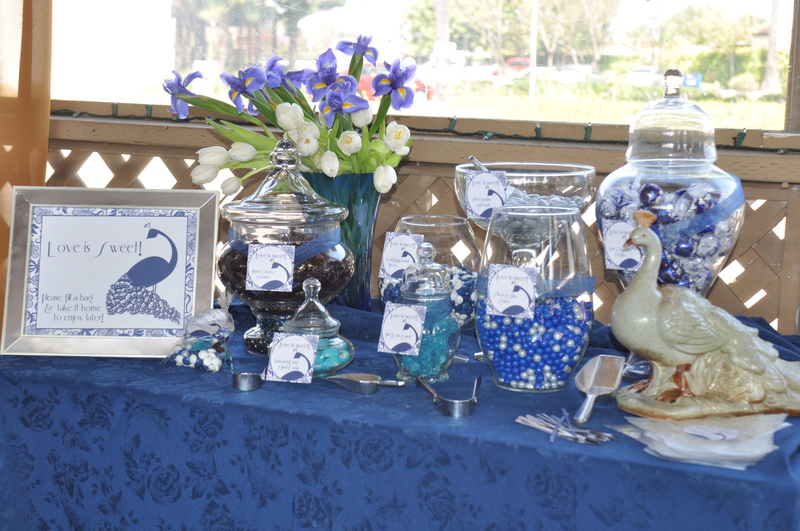 A sweets table or candy bar? A slide show? Trading card favors? Or are your guests more of the “stand around and enjoy each other’s company” variety? Keeping guests busy at a party is one of the hardest jobs for any planner; it involves a thorough knowledge of your party space and your audience, and (hopefully) a good deal of thought. We’ve all been to parties where we were bored to tears (or worse, uncomfortable with strange getting-to-know-you games that didn’t make a lot of sense). Tying your theme and your activities together helps you to have a clearer picture of what your guests will be doing, and helps your guests to better enjoy your careful planning. Photo credits: Book Drum, Object Lessons. Any Ideas? – What Does the Honoree Really Like? Forget for a minute that vintage-inspired weddings are “in.” Forget that sweet tables are the hot thing, or that jewel tones are “so last year.” What does your honoree like? If you’re the bride and groom planning a wedding, what is your style? I got married in 2008. This was the very beginning of the mismatched table decor trend. In fact, the first magazine article I saw mentioning putting flowers in various china vessels was published a month or two before my wedding in Martha Stewart Weddings. But my husband and I – both avid swap meet goers, both in love with vintage looks, both more at home with mismatched and homespun than slick and modern (our house is a great example – we’ve furnished almost the entire thing secondhand) – decided early on in our planning process that we’d enjoy picking out vintage china pieces to fill with mismatched flowers and decorate our tables. This theme – a whimsical vintage garden – was born when we first visited our venue (a vintage-themed restaurant) and was the perfect mixture of our taste with distinct, inexpensive details. If you are more couture than campagne, a mismatched garden look is probably a mismatch for you. Likewise, if I’m planning a birthday party for a 4-year-old-girl who is obsessed with monster trucks, I probably won’t be dressing her up as a princess (unless she’d like a princess-at-a-monster-truck-rally party, in which case I’m all for it!). Trends are trends – but just as in fashion, if a trend doesn’t fit you, don’t wear it. Skinny jeans or cutoffs may be in vogue, but I look like a tree stump in them – so I consistently choose long bootcuts. Don’t reach for the “in” thing if it’s just not you. Likewise, if a trend does happen to be you, don’t be afraid to embrace it. You may remember my peacock bridal shower invitations. What I didn’t say in the original post was that my friend, for whom I’m throwing the shower, originally wanted peacock feathers to be featured at her wedding. But when she realized that they were a hot wedding trend, she decided against them. She didn’t want to follow the crowd. I understand and embrace the creative spirit – but no two parties are identical, even with the exact same printed materials. Just because something has been done a hundred times doesn’t mean it’s not worth doing again – if the theme is something you love. Any Ideas? – How Many People Will be in Attendance? How does this play into the theme, you might ask? What does it matter if I’ll have 10 people at my event, or 100? Well, unless your budget and your space is unlimited, the number of guests in attendance is crucial to the planning of your event. You may have your heart set on a fancy sit-down dinner for 200, but if your backyard only has enough room for half that many seated, you may have to plan on serving cocktails and appetizers instead, or cut your guest list in half. Similarly, if your budget is only $1000, you can invite 10 people and spend $100 on each, or 100 people and spend $10 on each. Not surprisingly, the less people you expect to have, the more elaborate a theme you can have. Consider favors – just a small part of a wedding or other event. 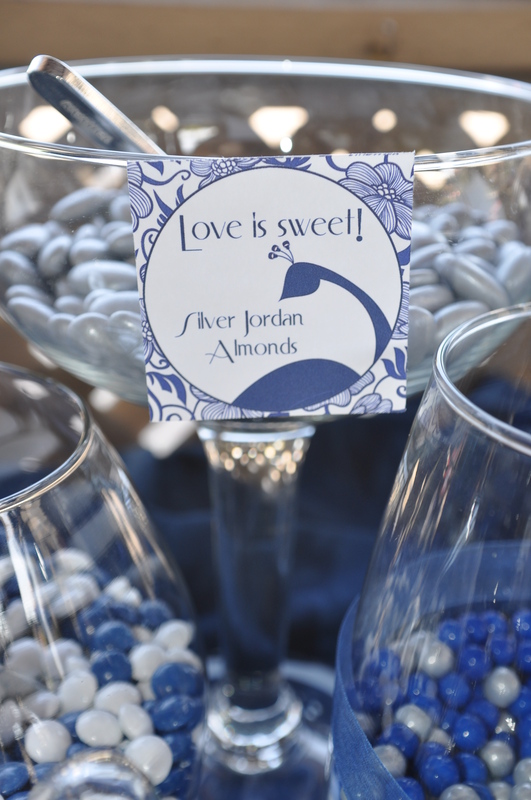 With a $250 favor budget, you can give 200 people a handful of jordan almonds wrapped in tulle, or 10 people personalized sterling silver charms. 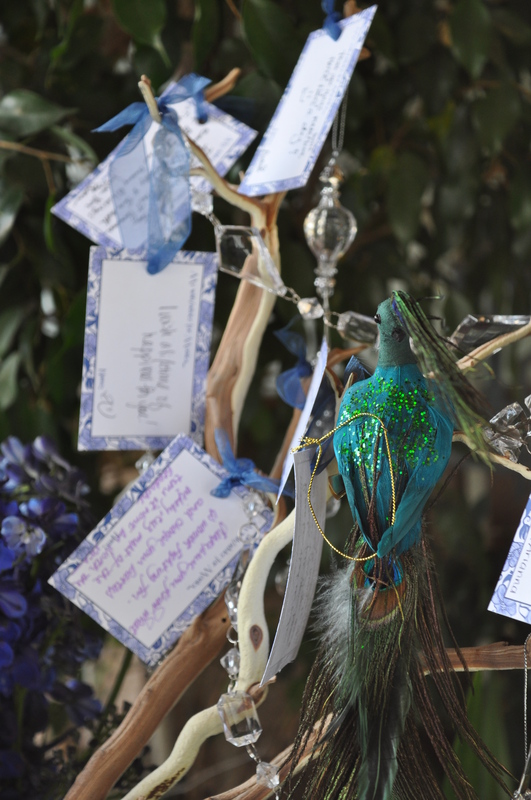 You can still have the same general theme – say, bohemian wedding – if you have 15 guests or 150. You may still have the same basic costs – like DJ, coordinator, photographer, lighting, and paper goods – but your per-person budget will determine how many beautiful themed details you can include. The more guests you have, the less you can spend per person. Your expected guest list also helps determine your exact venue – if you absolutely must have room for 300 wedding guests, the back room at your favorite restaurant probably can’t hold them. But if you’re having a small wedding celebration with just a dozen close family and friends, there’s no reason to rent a ballroom. If your venue is set – say, your home – you’ll need to know the number of guests early on for planning the flow of traffic. In our living room and kitchen, we typically can’t fit more than four comfortably. But for my husband’s board game birthday party, we removed all the excess furniture, set up a bunch of small chairs, and transformed our kitchen into an appetizer serving space. It was tight, but we enjoyed the company of eight of our closest friends (and could have probably fit another couple or two!). One of my favorite recent examples of the importance of knowing your guest list is the Cinderella-Inspired Birthday on Hostess with the Mostess. The party host admits that cutting down the guest list was hard – for her daughter’s previous birthday she’d invited over sixty kids – but was able to make a beautiful, lavishly-decorated party with elaborate gift bags for just ten guests. “This year, ten girls was just perfect!” she says. Had she tried to plan the same party for even twice that many guests, it would have turned out very differently; from the setup of the party space to the gift bags, she would have had a completely different party. This is not to say it wouldn’t have been lovely – or that you shouldn’t invite every last one of your friends to your next bash – but the number of people you invite will always be a consideration for your space, your budget, and the scope of your party. Any Ideas? – What is My Audience? The part audience plays in the planning process may not be as obvious as the type of party you’re having, or the when and where. So I’m going to use examples heavily here. 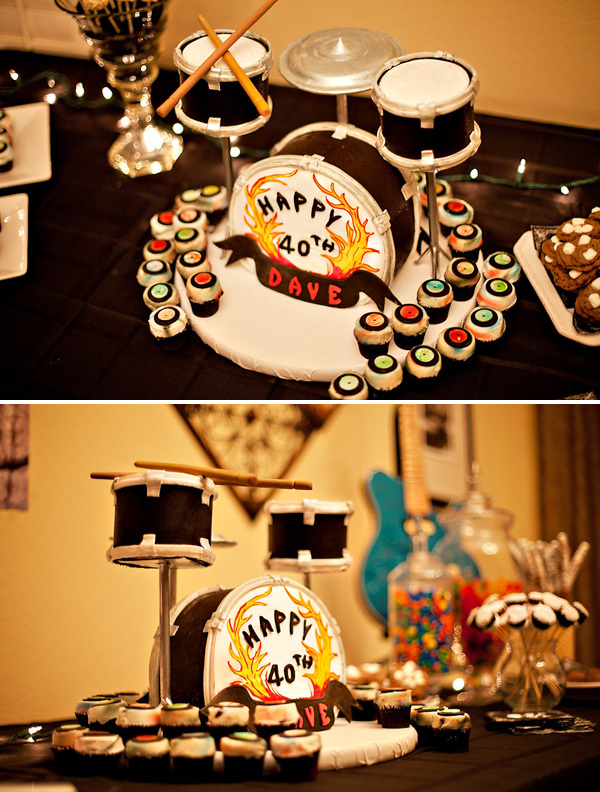 Say I’m planning a rock star birthday party. What do you think of for thematic elements? Posters on the walls? Guitar Hero on the Wii? A cover band? Big hair? Safety pins? Now let me suggest that this party is for a 7-year-old girl. Suddenly there are sparkly pink microphones and glam makeup a la Jem and the Holograms, a fun photo session with dress up clothes, and Disney karaoke on the Wii. If the party is, instead, for a 30th birthday, I might insist that all attendees wear their best grunge-inspired clothing and play endless Nirvana. For a 40th birthday, the theme might be based around Spinal Tap. That is, unless the birthday girl has dreams of being Joan Jett (or Jem!). What’s appropriate for a 7-year-old girl and her friends may or may not be what’s appropriate for her mother or her older brother and their peers. Take another example: the tea party. Now, I could easily plan a tea party for that same 7-year-old girl (of course, if she’s more of a rock star, she might not be too happy with me for planning her such a sedate theme!). There would probably be lots of ruffles, some pretty tea cakes, a princess dress-up box, and plastic tea set favors. If that little girl grew up and was having her bridal shower with a tea party theme, I’d focus more on soft floral accents, cucumber sandwiches and scones, perhaps some great hats for her guests to wear, and tea bag favors. If she were celebrating her eightieth birthday with a tea party (as my grandmother did nearly a decade ago), the food and favors might be the same – but the party activities would be distinctly different (can you imagine a room full of eighty-somethings playing a risque game of shower charades? okay, maybe you can…). Too much estrogen for you? How about a party with a casino theme? For a teenager’s birthday, they might enjoy dressing up, “gambling” for prize tickets, and drinking fancy non-alcoholic beverages (think slushy virgin margaritas and muddled mint and club soda “mojitos”). For a 21st birthday, though, the drinks are alcoholic and guests are learning real gambling techniques. For a bachelor party, poker dealers and bartenders are beautiful women and the beers flow freely. For a 40th birthday, the guests come in their nicest attire (think Monte Carlo) and the martinis are shaken, not stirred. Know your audience – age, gender, and likes/dislikes – and you’ll be able to tailor your theme to fit them. Any Ideas – When and Where? This question may also sound like an obvious one, especially if you’ve already chosen a time, date, and place. But any themed ideas you come up with should have as much to do with the timing and location of your event as with the type of event. For example, if I were planning a wedding and needed to come up with a theme, I’d first want to know the season in which the wedding will be taking place. This will help determine what flowers are seasonally available, what decorative elements will easily be accessible, and what the bridal party should wear. Then I’d want to know the basic characteristics of the location where the wedding was taking place. If I’m planning an outdoor wedding in the dead of winter in a snowy locale, it’s not very practical to put my bridesmaids in yellow cotton shifts and give them bouquets of rannunculus and lily of the valley. But that very same bridesmaid dress-and-flower combination would be perfect at a summery outdoor ceremony. And a fur wrap with a long burgundy brocade and a bouquet of roses and mistletoe – or pinecones! – would look a little strange on an eighty-degree day. Sometimes it’s all about the details – the same color of bridesmaid dress might be just as perfect during the winter as the summer, but you’d pair it with different accessories. 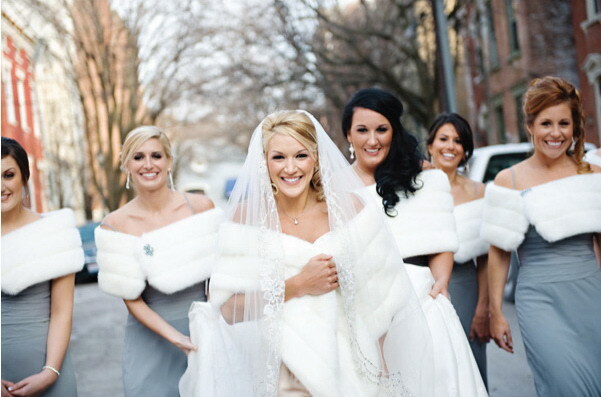 For example, both of these weddings (one summer, one winter) use gray bridesmaid dresses – but the winter one pairs the dress up with a white fur while the summer one uses a pop of bright yellow. Likewise, the time of day of a wedding plays a big part in the planning. A sunset ceremony and candlelit dinner will have a distinctly different feeling than a morning ceremony followed by an informal bunch on the lawn. You’ll want to have different food, different fashion, and different decor. Even for non-wedding events, such as showers and birthday parties, timing plays a huge part. A bridal shower brunch will serve different food than a bridal shower tea or a bridal shower dinner (think quiche and mimosas, versus cucumber sandwiches and iced tea, versus a pasta dish with wine). You may be planning your party in a different locale based on the time of day (that patch of lawn might be lovely in the morning but without some shade may be wiltingly hot at 2 pm; likewise, the seaside bluff may be perfect midday but have a chilly breeze in the evening). Think about the basic when and where of your event before finalizing thematic details and you’ll be able to ensure that all the elements work together. Any Ideas? – What Kind of Event Am I Having? What kind of event am I having? This might be obvious. I’m hosting a bridal shower or a birthday party, or a wedding. But there is a huge difference between the scope of, say, the birthday host that pays Christina Aguilera a million dollars to sing for an hour and the birthday host that asks all their friends to pitch in a potluck meal. Both parties can be spectacular – one of the most fun weddings I have ever been to had a potluck dinner (which is next to impossible to pull off but was flawless) and in total cost less than most gowns featured on Say Yes to the Dress. But until you really think about the kind of event you’re having you can’t really move forward. I’ll admit this is overall a relatively simple question. But if you’ve ever been the Maid of Honor for a wedding, you might remember a moment of panic when you realized that all the slightly racy shower games were going to be played to an audience including the groom’s grandmother. Consider the type of event – not just “wedding” but “intimate family wedding” or “minimalistic urban wedding”, and not just “bridal shower” but “relaxed family bridal shower” or “silly risque bridal shower with friends” – you want to have before everything else. Once you figure out what kind of party you are going to be having, you can start considering the answers to my other questions. No, really – if you asked me this question this week, don’t worry – I promise you’re not the only one (even this week!). And I like the fact that people think I have good ideas! The answer to this question, though, is a lot more complicated than a simple yes or no, or even a simple theme. Themes for events aren’t just dependent on the event itself (a birthday party for a four-year old girl, for example, which is something I haven’t been asked about lately!). When asked this question, I could rattle off several themes (“Have you thought about ponies yet? Yes? Okay, let’s see, penguins are in vogue right now… Or how about gardening and ladybugs?”). But for anyone who has kids or has seen a kids’ nursery, there are about as many themes as there are people. A one-size-fits-all approach simply won’t work. In addition to the likes and dislikes of the person for whom the event is being thrown, a ton of other factors are at play. For example, the audience of the event: Are you having a houseful of rowdy twelve-year-old boys? Or a playroom filled with toddlers? Or hard-partying single twentysomethings? Or sedate grandparents? Obviously a heavy metal-themed party isn’t going to go over well in a bridge-playing country club set (unless, you know, it would, in which case, I want that job!). A party princess won’t be welcome at the birthdays of most teenage boys (unless, of course, she’s a different kind of princess altogether). And most bridal showers are completely different affairs than twenty-first birthday parties. You can start to see why I can’t simply answer, “Sure, I’ve got some great ideas, and here they are.” I’ve got tons of them floating around in my head – but it’s like walking into a giant bookstore blindfolded and trying to pick out a specific title. Until you know which part of the store houses what kind of books and can narrow down how the books in that part of the store are organized, you’ll only be groping blindly, pulling books off shelves at random. What does the honoree (or honorees) really like? Do I already have a space available that can handle the number of people I’m expecting and the type of party I’m hoping to have? Over the next few weeks, I’ll delve deeper into each of these questions to help you start to figure out your event’s theme, or to give you the tools to approach a planner to create the perfect themed celebration. I love me some vintage! 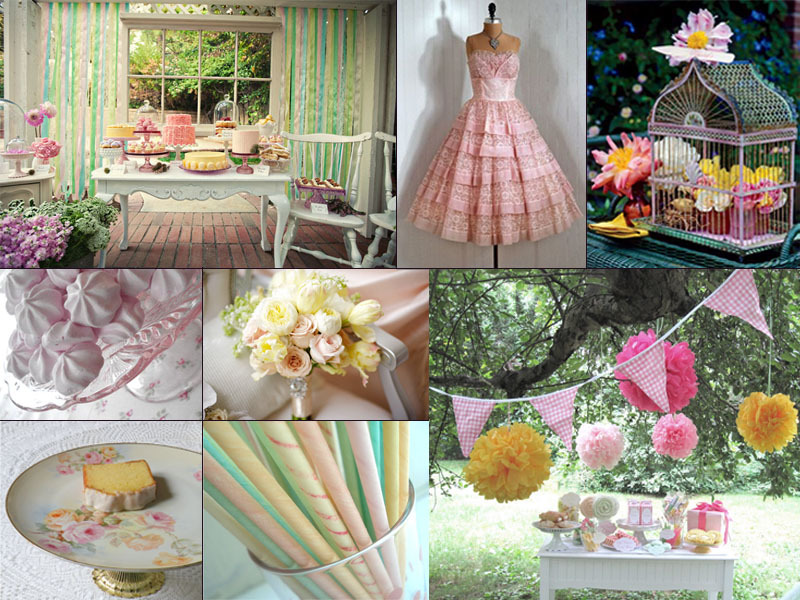 I was inspired by a bride I’ve been consulting with to create a vintage sweet table inspiration board. I love the tones of blush and daffodil! I only wish I’d been able to find some photos of flowers arranged the way I can see them in my head. I’d love to gather ranunculus, peonies, daffodils, dahlias, gerberas, and freesia together in just the right messy way, and I’d love to see them in the gorgeous pale pink glass vase in my event rental catalog. I’d also add a bunch of fairy lights and some chinese lanterns in pale pink, yellow, green, and white. Photo credits (clockwise, from top left): Ruffled Blog, Little Loveables, Country Living, Kate Landers Events, KristopherK’s Flickr Stream, Old Fashioned Lemonade, The Sweetest Occasion, Karen Tran Florals. 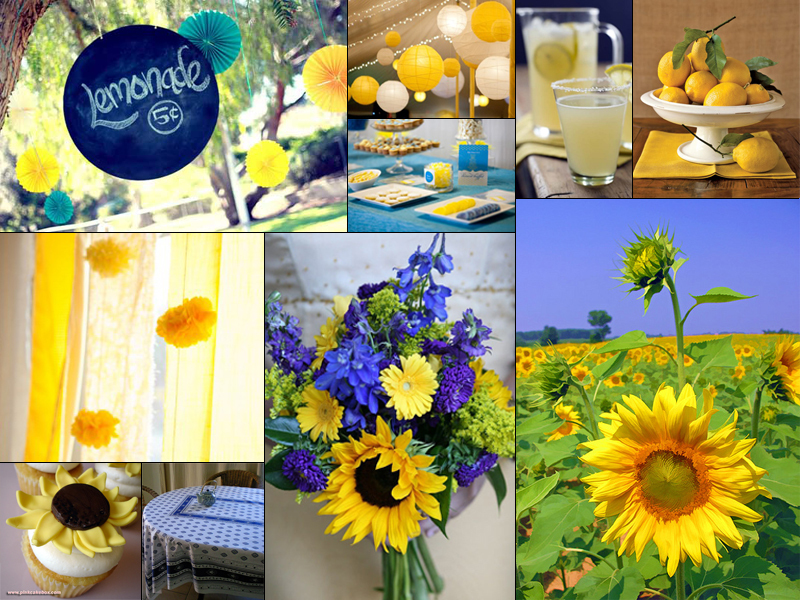 Maybe it’s the dismal weather we’ve had today: clouds, wind, and rain… Maybe I’m just really looking forward to summer… But my latest inspiration board creation is sort of inspired by Tuscany and Provence, and features a gorgeous sunny yellow color contrasted by deep blues. I’d love to plan this party for a bridal or baby shower, or a birthday party! Image credits (clockwise, from top left): Hostess with the Mostess, Tickled Pink, Kara’s Party Ideas, Recipe Bloom, Country Living, Dit49’s Flickr Photo Stream, Wrapped in Happiness (but the photo was taken by Charlotte Geary), A French Tablecloth, Pink Cake Box, The Sweetest Occasion.